We’d love your help. Let us know what’s wrong with this preview of 101 Days of Christmas by Mandi Ehman. 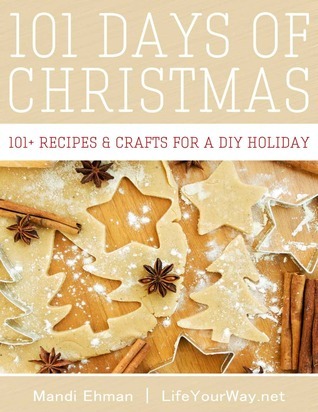 Drawing from the popular 101 Days of Christmas series at LifeYourWay.net, Mandi Ehman has handpicked the best recipes, crafts and projects from the archives and compiled them into one easy-to-navigate ebook. Whether you’re looking for a craft to do with your children, a new cookie recipe to share with your friends and neighbors, or a simple handmade gift to make for someon Drawing from the popular 101 Days of Christmas series at LifeYourWay.net, Mandi Ehman has handpicked the best recipes, crafts and projects from the archives and compiled them into one easy-to-navigate ebook. Whether you’re looking for a craft to do with your children, a new cookie recipe to share with your friends and neighbors, or a simple handmade gift to make for someone you love, this ebook includes 101 simple ideas and tutorials! To ask other readers questions about 101 Days of Christmas, please sign up. Cookies and Baked Goods, Beverages, Brunch Recipes, Homemade Candy, Other Sweet Treats, Project for Kids, DIY Decor, Handmade Gifts, Gift Wrap, Handmade Ornaments, and Paper Crafts; along with printables and ideas for Advent. I have not made any of the recipes yet, but I hope to make at least one or two. I may try the Peppermint Meringues. I definitely want to try the Hot Vanilla. I love white hot chocolate from Dunkin' Donuts and want to see how this homemade version compares. I would love to tr Cookies and Baked Goods, Beverages, Brunch Recipes, Homemade Candy, Other Sweet Treats, Project for Kids, DIY Decor, Handmade Gifts, Gift Wrap, Handmade Ornaments, and Paper Crafts; along with printables and ideas for Advent. I have not made any of the recipes yet, but I hope to make at least one or two. I may try the Peppermint Meringues. I definitely want to try the Hot Vanilla. I love white hot chocolate from Dunkin' Donuts and want to see how this homemade version compares. I would love to try the Cranberry-Apple French Toast Casserole, I love french toast, cranberries and apples so this sounds delightful. It will not be for Christmas breakfast but maybe one day the week my mom is visiting. I love marshmallows and would love to try homemade ones so #27 Chocolate-Covered marshmallows sounds good too. I could go on and on... there are a LOT of good looking recipes. The Projects for Kids are to juvenile for my children, but some of them look cute. The DIY Decor is not my style... except for the Snowy Windows... I may try them some time. In the Handmade Gifts section I liked the Etched Glass and Marshmallow Shooters for the grandkids some day. I loved the Fancy Paper Cookie Plates for giving to plates of cookies and treats to friends and family. In the handmade ornaments section my favorite, and one I will be trying next year, maybe, is the string ornament. I loved the Button Cards (#95), Paper Stars (#100), and love the idea of letters in my kids stockings every year (#101). I may try that this year. Some of the Meaningful Traditions are traditions we already do as a family. Annual Ornaments is one thing we do. Every year I make (most years) or buy a new ornament for each family member. This year my daughter Rachel is making the ornaments. We have participated in a cookie swap some years and we have done Operation Christmas Child as well, the kids used to visit a nursing home with their homeschool choir, and we sang at a nursing home as a family a few years. None of those things we are doing this year, however. I also love the idea of new Pajamas to open on Christmas Eve and wear for Christmas morning... a tradition I hope to start with any future grandchildren. We have never slept by the tree but I like that idea as well, not Christmas Eve but maybe another night. There are links to many printables, checklists, and things to help you plan your Christmas. I love the idea of reading a Christmas book every day to the kids. I have collected a bunch of Christmas books and we keep them in a tub and bring them out every year, only for Christmas. There are also a lot of ideas for fun Advent Calendars to count down the days until Christmas. This is really an incredible book and good for almost the whole year --- has wonderful recipes (with pictures included)! Christmas decorations, traditions, actives --- for both children and adults! Just wonderful knowing people do want to have the Spirt of Christmas every day! Usually once I read a Kindle book I delete it from my Kindle BUT THIS ONE I'M KEEPING!!!! Excellent book. Wish I had it 45years ago! There are still plenty of ideas to use in our golden years. Recipes start out with a small color photo and a summary of the dish. List of ingredients and directions on how to make. There is no nutritional information or pictures. Each section has its own table of contents. Projects for kids I really appreciated seeing as some are do it yourself crafts-no baking involved. Ideas for other community projects are listed at the end. A great collection of things to bake, make, repurpose or decorate. Most are very child-friendly and all are quite easy or take very little time. I must've bookmarked at least 20 just on my first read-through! It even contains printables and some extras to help organize and plan for Christmas, including Jesse trees or other things to mark Advent. I'll be coming back to this one. This is a really amazing book! I highly recommend this for everyone. Included are tips and gifts for every budget, recipes and decorations for all. Plenty of suggestions for everything Christmas that you can think of and printable guides, photos, ebooks and lists to make it all happen. You can't go wrong with a book like this. This book has some fairly good Christmas-related recipes and craft ideas. The craft ideas seem simple enough and most would be good to do with children. The author had some nice ideas for Christmas traditions at the end of the book. If you're looking for things to do with the kids this Christmas, you might want to pick this book up. This is a great book full of recipes and crafts for Christmas. There are lots of crafts children can help with too, and some that older ones can do on their own. There are all kinds of ideas for making Christmas special without a lot of money. Most of them focus on the meaning of Christmas in its Christian context. A free kindle book. Just okay. This is a great compilation jam packed with recipes for food, cakes & beverages as well as craft ideas for the kids. Will be doing some this year for sure. Some great recipes and crafts I am excited to try! Ok I wouldn't call it the best Christmas book ever. I would call it a good decent book with plenty of Christmas ideas. Recipes to Try: Hot Vanilla, Wassail, Chocolate Peanut Butter Bark, Cranberry Crunch Bark, Oreo Bark, Oreo Truffles, Chex Apple Pie Mix.